With launch of in-memory columnar database SAP HANA, we had an interesting invention of pushing down the business logic very close to the business data. We were able to execute mass data runs with Business Rules on millions of records in a single call without the need of pulling up the data into an application server and loop over the tuples applying business rules. SAP HANA Rules Framework provides a user friendly interface that enabled business experts with little to no SQL knowledge to express business logic as Decision Tables, Text Rules. With HRF SP12 we have a new Rules HANA Connector that enables SAP Cloud Platform Business Rules to deploy the Rules Service a.k.a DECISIONS into SAP HANA as in-memory database procedures. We call this pattern as Analytical Rules based on the use-cases we learnt from our customers and SAP Applications. Learn more about how you can try this new pattern in this blog. The Rules HANA Connector is light weight adapter/connector(XSA application) that enables SAP Cloud Platform Business Rules to act as a central decision service in the cloud to deploy rules service to different managed systems in the on-premise landscape of the customer. This approach gives customer’s with a unique opportunity to re-use rules across different business applications and also different rule runtimes as we have offered abstractions in the enterprise rule model to keep the design time content isolated from runtime information via annotations. One of the most important usage of business rules in SAP has been in SAP Business Suite using NetWeaver ABAP BRFplus. In our vision for unifying business rules technologies in SAP we always consider the data to be federated across different SAP Solutions(systems) and other 3rd party systems. But our goal is to bring the rules to systems where the data resides rather than bring data to where the rules are managed to have a decision executed. This means having support for local rule runtimes is essential to have applications in the Digital Core (S/4HANA) execute business rules locally in ABAP runtime. 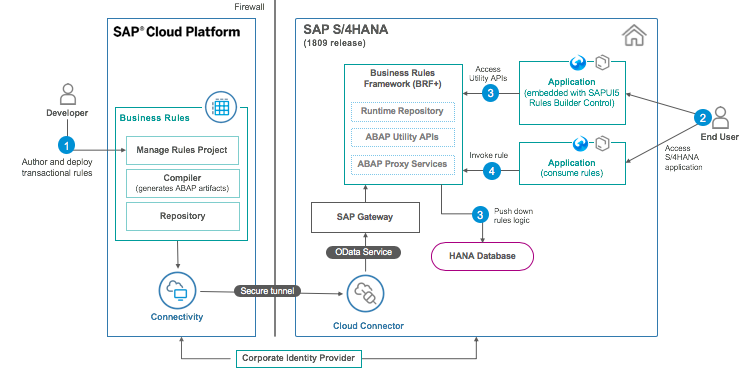 With 1809 S/4HANA we have enhanced BRFplus to expose APIs that enables SAP Cloud Platform Business Rules integrate and deploy rules service into ABAP. Since this time we have ABAP running on HANA database it gives us an unique advantage to decide how to optimize the rule service to be pushed down into HANA as ABAP Managed Database Procedures. As part of an open Platform approach we are moving ahead into Content Marketplace model where SAP Applications, Partners can publish Business Rule Project(with prebuilt Vocabulary, Rule Service, Rule, Ruleset) as ready to use content for all SAP Customers. We today start with simple educational content which we have published in SAP API Hub to kickstart this initiative.